By Fionnuala Holohan | October 4, 2011. I pressed the doorbell of the half-shuttered Dublin Gold Exchange on James’s Street and waited for the cashier to open the door. I was there to check how much I could get for my mother’s gold wedding ring from the cash-for-gold sellers in the Liberties area and he was my first port of call. I chose that piece of jewellery for my survey as I was less likely to get carried away by either patter or poverty to sell it – she’s a formidable woman, my mother. After letting me in, the cashier quickly retired behind his counter and waited for me to show him what I had for sale – his expression weary and pre-occupied. I handed over the ring, making it clear I was only looking for a quote. His expression fell further. He took it, peered at it through his magnifying glass, weighed the gold and said, “Eighty-five euro. It’s 18 carat you know.” He went on to say if I’d come a week earlier I would have been given a better price. This was true – the last week in September had seen a 20% drop in the price of gold and other precious metals on the world markets. The U.S. salvage company that located a sunken WWII British cargo ship off the Irish coast with seven million ounces of silver on board had €21 million wiped off the value of their find during that week. Three weeks previously, gold in particular had been trading at a record price of $1,900 per ounce and the sharp four-day fall was raising questions as to the value of gold as an investment. Big name investors worldwide continue to contradict each other on the topic. John Paulson, who made €2.7 billion by foreseeing the subprime collapse in the U.S., continues to buy. Others, such as George Soros, have sold out of the market for fear of a new bubble. “It’s the oil versus gold balance,” said the cashier, going on to claim that developments in Libya were influencing the commodities market in favour of oil. Whatever the reason, the drop in gold prices has precipitated a sizable buying frenzy, and gold prices are predicted to rise again, above the record highs of late August and early September. My next stop was the CashGold shop on Wexford Street. The cashier buzzed me in to the waiting room, a clean and white-washed foyer lined with flyers and information on gold weights and measures. There was one other customer, who chatted breezily with the cashier. “I’ve got my holiday money now,” she said as she left with her payment. The assessment technique was different at CashGold. The cashier took my ring, and applied several drops from an array of small bottles in front of her. She then rubbed the ring vigorously on a black pad, and repeated this several times. I’m told this is a scratch test to determine the gold carat – the percentage of pure gold. After tramping around in vain for a promised gold exchange shop on Crampton Quay, I decide to tackle a few of the more prominent online gold traders. Goldparty.ie claims to be a 100% Irish-owned business and operates through postal services, agents and by hosting ‘gold parties’. A handy calculator on the top right-hand corner of the website allows me to calculate their price offering – €67.52. GoldtoCash.ie operate a similar model and their online price was €44.10. Goldrush.ie are part of the Jack & Jill Foundation, who also buy via post. Their online calculator offered a price of €58.38. Of this, €16.95 goes to the charity, which freely admits it does not have access to the global gold markets but sells to intermediaries who melt down the gold for trading – an implied explanation for the much lower price. 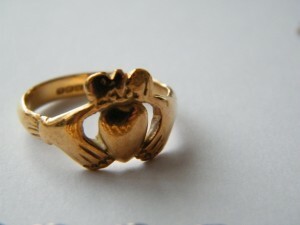 Scrap-gold-buyers.ie surprised me by offering €102.55 for the ring. Theirs is also a postal service. A similar survey on cash-for-gold prices performed by the Consumer Association of Ireland in April this year found similar variations in price, with online traders usually offering less. The UK magazine Which? found last year that television advertisers offered the worst prices of all when compared to pawnbrokersand jewellers. So – do you sell or hold on? As the trend in gold prices has been upwards for a long time – from €255 in October 2001, €450 in October 2006 and currently around €1600 and climbing – cash-for-gold outlets are likely to be with us for some time. However, you are paying for the service – my ring would have been worth €188 based on the gold spot-rate for that day. The best advice is to keep an eye on the market prices for gold, shop around when the price is good and to not be afraid to ask questions.